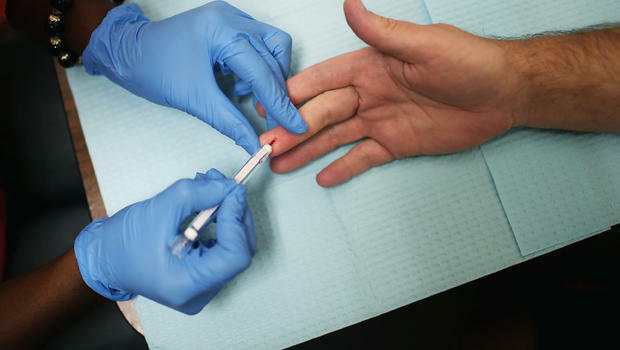 A health educator uses a syringe to take a drop of blood from a man's finger while conducting an HIV test at the Whitman-Walker Health Elizabeth Taylor Medical Center September 27, 2012 in Washington, DC. Twenty years ago, Maria Davis got tested for the human immunodeficiency virus (HIV) as part of an application for a life insurance policy. She thought nothing of it until week and a half later, when she received a letter in the mail telling her she'd tested positive. "It was devastating," she told CBS News. "I didn't know anyone else who was HIV positive. Back then it was known as the 'Monster' and thought of as a gay white man's disease." Maria Davis has lived with HIV/AIDS for 20 years. Davis, a native of New York City who is now 55, soon learned that she contracted the virus from her then fiancé, who knew he was infected but did not tell her. With a successful career as a hip-hop promoter, working with artists like Jay Z, Queen Latifa, and P. Diddy, she felt she needed to keep her illness secret. But in 1998, her condition declined rapidly and was hospitalized for over six weeks. Doctors informed her the virus had progressed into AIDS. "I was 95 pounds," she said. "I was too weak to do anything. After all that I went through, I had to tell the world that this is serious and we need to talk about it." Today, Davis's illness is under control and works to spread awareness and encourage others to know their HIV status. In fact, people unaware that they are living with the virus contribute to nearly one third of HIV transmissions, the Centers for Disease Control and Prevention reports. According to new figures released by the CDC on Friday, 14 percent of the 1.2 million Americans with HIV don't know they're infected. The report was released just before National HIV Testing Day June 27. Experts say that although HIV was once considered a death sentence, many people with the virus now go on to live normal, healthy lives. "The medicines have become safer, simpler, and more effective," Dr. Cameron Wolfe, an infectious disease specialist at Duke University Medical Center, told CBS News. "If you wound the clock back 10 or 15 years, treatments involved multiple tablets that were more prone to giving people side effects and their ability to restore health was just not particularly effective compared to what's available now. Most of the patients I see today take one pill once a day and have absolutely no side effects neither from their pill nor the HIV. You would have no idea walking past them on the street that they were on HIV treatment." As far as life expectancy in the United States, Wolfe said that if people are diagnosed in their 20s, "there's no reason that you shouldn't live through your 70s, provided that you know about it and pick it up early, you get connected to care, and that you maintain diligence with treatment." Getting tested and treated could not only improve their overall health, but prevent the further spread of the virus. While certain populations, including gay and bisexual men and African Americans, are at a higher risk of contracting HIV, Wolfe said anyone who is sexually active should be tested. "The more we move away from select groups and the more we try and move toward that this is part of a standard discussion that you have with your healthcare provider period, then I think the better we get," he said. Davis, who is a spokesperson for Merck's HIV awareness campaign, Project I Design, also works with a number of HIV/AIDS organizations, including amfAR. She continues to speak out to spread the message of the importance of HIV testing. "I have no problem telling people that I'm living with AIDS," she said. "The most important thing you can do is empower yourself. You don't have to be an activist like me, but what you can do is get tested and know your status."